The Italian government threatened to shut humanitarian groups operating migrant rescue ships in the Mediterranean out of the country’s ports if they do not sign a “code of conduct”. Italy fears the ships are making it too easy for smugglers to operate and they act as an incentive for migrants wanting to reach Europe. An Italian court suggested they collude with Libya-based smugglers, which the charities deny. Italy’s coastguard co-ordinates all rescues off the Libyan coast. Almost 100,000 have been brought to Italy this year adding to the half a million brought over the three previous years. 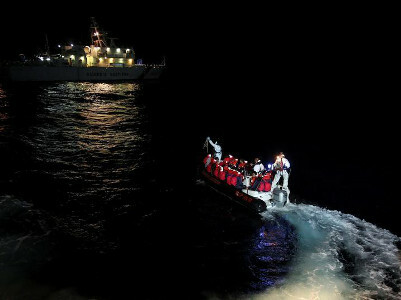 As a high-ranking Interior Ministry official illustrated the 12-point document charities fear will limit their capacity to save lives one of the groups, Proactiva Open Arms, recovered 13 bodies off the Libyan coast. A photograph posted on Twitter showed corpses strewn across the deck of a large yellow raft crammed with more than 160 migrants. More than 2,200 people have died in the Central Mediterranean this year. Members of nine non-governmental groups working at sea sought changes to the document, ultimately driving Mario Morcone, chief of staff for Interior Minister Marco Minniti, to express frustration, according to a source at the meeting. “Your solidarity with Italy is hypocritical,” he quipped, according to the source. There will be another meeting on Friday at the ministry, when NGOs must submit the changes they seek. Since February the charities have been accused of colluding with people smugglers and attacked in Italian media. This week a dozen far-right activists set out to sea to monitor their work. The NGOs have repeatedly denied ties to smuggling and no evidence of wrongdoing has ever been presented. They say their only objective is to save lives. Among the controversial points is one asking NGOs to let police board to search for smugglers among the migrants. Another point forbids ships from transferring people to other boats, a measure apparently aimed at shutting down smaller rescue ships that normally transfer migrants to larger vessels for passage to Italy. Fulvio Vassallo, professor of international law at the University of Palermo, said in an interview on Radio Radicale many points in the “code of conduct” would be in violation of international maritime law.